President Akufo-Addo has appealed to all sons and daughters of Dagbon to unite behind the new Yaa-Na, Mahama Abukari II, describing him as a man of experience and dignity who will discharge the duties of his new office with distinction. 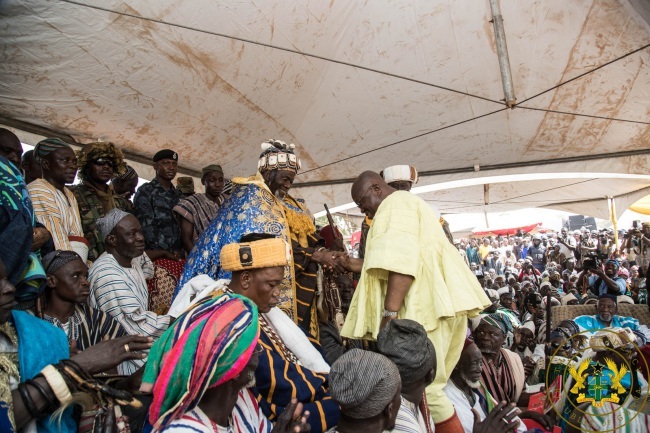 Speaking at the enskinment and outdooring ceremony of the new Ya-Naa at the Gbewaa Palace, in Yendi, on Friday, 25th January, 2019, President Akufo-Addo urged all to give Yaa-Na Mahama Abukari II all the support he requires, as he sets about to administer the affairs of the state of Dagbon. To the new Yaa-Na, President Akufo-Addo made a commitment to him, stating that he do everything in his power, as President of the Republic, to assist him to administer the State of Dagbon in an atmosphere of peace and tranquility. The President congratulated, again, the Committee of Eminent Chiefs brilliantly chaired by the Asantehene, Otumfuo Osei Tutu II, together with the Overlord of Mamprugu, the Nayiri, Naa Bohugu Abdulai Mahami Sheriga, and the Overlord of the Gonja State, the Yagbonwura, Tuntumba Boresa Sulemana Jakpa, for their untiring efforts in bringing us this far.